We dive into a whole new era in the Sci-Fi Chronicles book, the previous chapter was about the beginnings of science fiction, and now we enter the pulp age, so there will probably be a number of fun books to read as well as some familiar faces in terms of movies and television… Buck Rogers, who first appeared in comic strips made the leap to the silver screen in the form of Saturday Matinee serials, so I figured, thanks to YouTube, I would settle in and watch his first big adventure… Planet Outlaws! 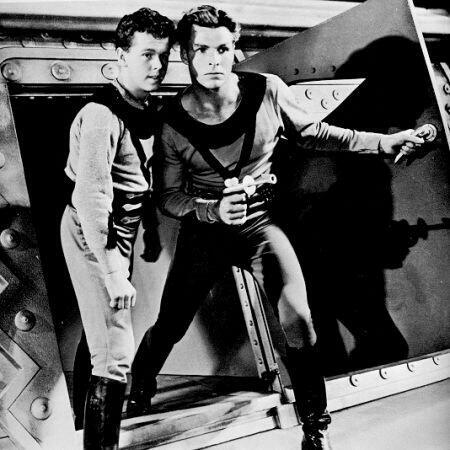 Buster Crabbe stars as Buck Rogers, who, accompanied by his youthful companion, Buddy(Jackie Moran), crash a dirigible in the Antarctic as they do a trip around the world, left in suspended animation thanks to some gas onboard and the freezing temperatures, the pair awake to find themselves in the year 2500!! 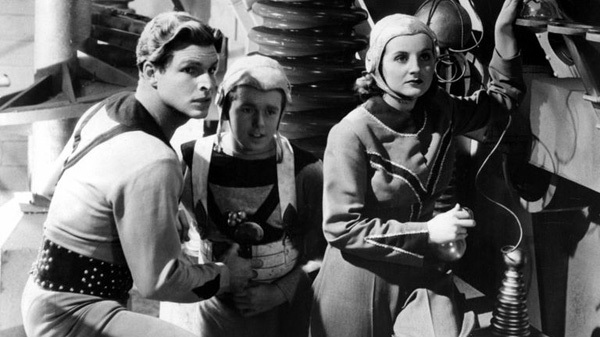 Discovered by a patrol from The Hidden City, the pair who seem to have no real problem with the fact that they are now some 500 years in the future and everyone is wandering around with strange shower caps on their heads for helmet, meet Dr. Huer (C. Montague Shaw) and Lt. Wilma Deering (Constance Moore). It is here that Buck and Buddy encounter ridiculous uniforms, cheesy effects and the revelation that the Hidden City is the last bastion of freedom on the planet, the rest of Earth is ruled by Killer Kane (Anthony Warde) or Leader Kane depending on what side you’re on, and his Racketeers. Huer reveals that the only way they can stop Kane is by seeking an alliance with one of the other planets, something else that doesn’t seem to phase our heroes too much either. Buck is able to take a lot of things in stride apparently. And just like that, with no training on how to fly a spaceship, or an update on their weaponry, Buck, Buddy, and Wilma are on their way to Saturn!!! They both evade and are pursued by Kane’s ships until they are shot down on the planet Saturn (thank goodness it has a breathable atmosphere) and both Kane’s men and Buck propose a treaty with the residents. What follows is a lot of planet-jumping as both parties travel back and forth between Earth and Saturn (I had no idea it was that close and that their ships could move so fast) each hoping to convince the ringed planet to ally with them. There are chases, fisticuffs, gravity belts (I actually like the way the characters land, it’s just a nice beat, but it resonated with me), shoddy spaceships, shaky sets, and a slap-dash script. Of course, it was meant to only appeal to younger viewers, so I have no doubt it held their attention, and kept them coming back week after week for the next installment.